Join the discussion on our forums! Come discuss Flame Geyser over in our dedicated Flame Geyser discussion topic. if you think about it, its kinda like a more flexible disciple of cthun but a 1/2 instead of a 2/1 and instead of buffing cthun it takes spell damage and can be used to trigger stuff like counterspell or the new manabind. The token it spawns is an elemental, so can be used for combos in subsequent turns. Also, 2 damage is a lot more flexible than 1 damage. Edit: didn't realise this was in 2017 before introduction, my bad. It doesn't spawn it, you still have to play (and more importantly, pay for) it. IMHO 3 mana 1/2 and 2 damage is bad, ergo this spell is bad. I agree with gbrading. 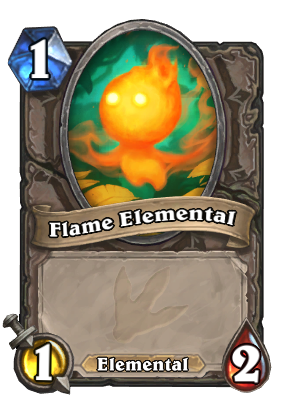 So, there is a minion (Fire Fly) and a spell (Flame Geyser) who add an Elemental 1/2 in hand. Maybe Shaman will have a weapon with the same effect? I hope to god they don't. I'm sick of Shaman. If anything, I hope Rouge finally gets a new weapon, poor valeera hasn't had a new toy since TGT, and we all know that was a disappointment. I wonder, will Malygos Mage make a comback? Just with this card wwhile, Thaurissan and ice lance out? Doubt it. Needs more fuel. The flame elemental token is cure though. Can't wait for the golden one. Anybody else think the Mage is gonna have an Elemental Quest? Play a certain amount of Elementals and get something? I think so, mostly because 2 of the cards revealed for Mage so far(including the Legendary) have the Elemental Tribe word. 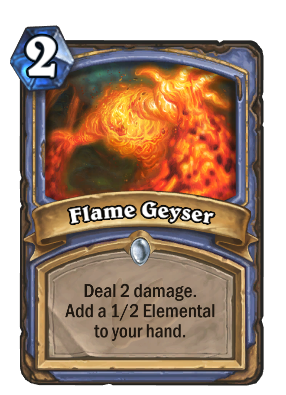 Pyros of course being Elemental, but then the 2-cost damage spell giving you an Elemental. Elemental Tempo mage might be a thing. Meta will show this card good or bad. Not convinced with this one, a 1/2 minion has little impact on it's own, and a total cost of 3 mana puts this card well behind the curve. It kills most early aggressive minions (Of the 3/2 variety) and gives you a body you can use to activate Elemental Synergy. It's probably better than it looks, but not as a "Good" card, more of a "Gets the job done" card. Also, my money is on Mage getting the "Play Elementals" quest, so there's that. I can't comment on elemental synergy cards I do not yet know of. We really do not even know what classes will get the most synergy, though I think mage is a contender. the 2 damage is alright. takes care of aggro minion and with a little spell power can do 3 damage and take care of most other 2 and some 3 drops. It's mostly another elemental generator card, and without knowing all the other cards which benefit from dumping a ton of elementals who knows how good a lot of cheap elementals will be. His grandad, Flame Geezer, is always complaining. Back in his day, you dealt two damage for 1 mana, and didn't have any of these fancy newfangled extra effects!